Friday, March 25th marks the 100th anniversary of the Triangle Shirtwaist Factory Fire in New York City when a fire in a garment factory resulted in the deaths of 146 workers. The 500 workers at this factory were mostly women, and predominately very young immigrants from Europe. As a fire broke out on the top three floors of a nine story building the piles of flammable materials, the exit doors locked by employers, the inadequate fire escape which collapsed, and fire truck ladders which only reached six floors high led many to leap from their deaths from the 9th floor. The local labor rights group, the South Sound Clean Clothes Campaign , honors this historical tragedy, the magnitude of which spurred campaigns to demand new safety and labor laws, while also highlighting the imperative need to address the many sweatshop abuses still present in the global marketplace. 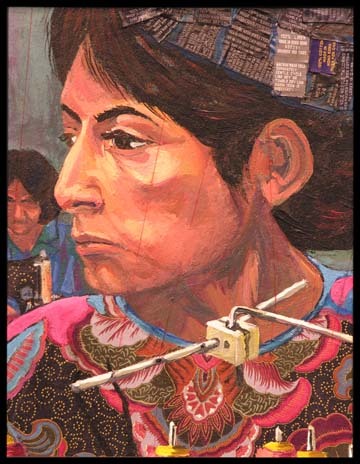 We will do this by exhibiting the paintings of garment workers around the globe by Northwest artist Janet Essley. Accompanying the exhibit displayed at Traditions Fair Trade (located at 300 5th Ave in downtown Olympia) will be an explanation not only of the Triangle Fire in 1911 but the sweatshop conditions, even the parallel fires, that still occur in garment factories around the globe, especially in Bangladesh. Entry filed under: Fair Trade, Labor rights, Sweatfree. Sign me up for email notifications!